Running Wild Media is currently developing an educational outreach program with the cutting edge virtual reality episodes of Season One of “Dive In.” This program will be implemented in the Bay Islands of Honduras with the help of our conservation partners MarAlliance and the Whale Shark and Oceanic Research Center. 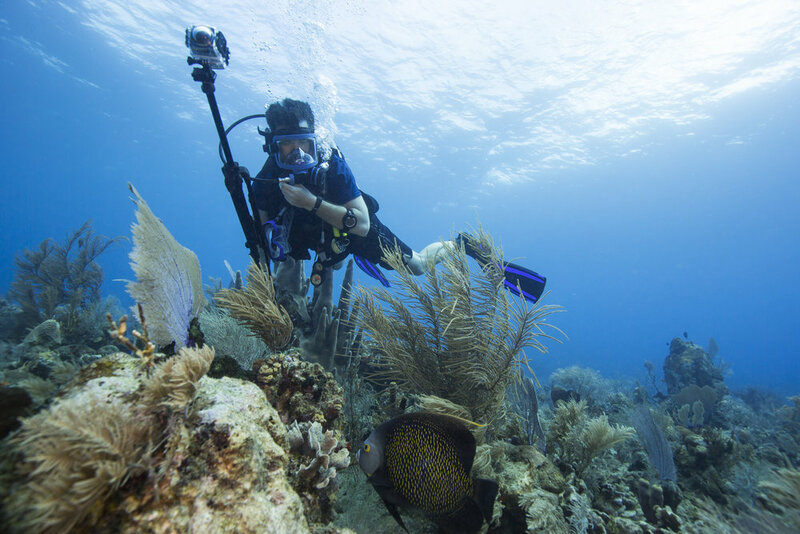 Students will get to wear VR goggles and experience the ocean that touches their shores and learn how their daily lives affect sea turtles, sharks, coral and more. Our goal is to implement our first program in February 2019! One of the most important wildlife rehabilitation and education centers in Central America for marine animals is currently working to build a sea turtle hospital that will allow them to produce x-rays of sick and injured turtles. The information gathered from the hospital will allow them to better treat sea turtles before their eventual release back into the wild. So far, several thousand dollars and supplies have been sent to the park organized by Preston Thompson. Co-Founder Justin Grubb is an honorary member of the YPI and BKSDA forest patrols in Cegar Alam Gunung Niut in Borneo, Indonesia. These rangers work tirelessly to protect the biodiversity in the forest reserve, especially the rare helmeted hornbill. This project, in conjunction with the Emerging Conservation Leaders, helped fund SMART training with these rangers to allow them to better adapt to different threats to the forest. Allowing tourism to brush with conservation & research in order to conserve, understand and educate. Founded in 2000, REST aims to bring attention to some of the most misunderstood and endangered animals in Namibia called the forgotten 5. The cape griffon vulture, cape pangolin, dwarf python, spotted rubber frog and the samara dik did. Co-founder Alex Goetz is an active chairperson supporting this valuable conservation organization.